When FinTech Australia first launched in February 2016, it had just over 50 founding members, less than two months of runway in our bank account and a shaky concept of what the future would hold. Just over a year later, I think our community can be justifiably proud of what we’ve achieved, so we’ve prepared an infographic outlining our milestones. First and foremost, FinTech Australia has been about advocacy and policy reform. The inaugural FinTech Australia board recognised right from the start that, for the Australian fintech industry to succeed, Australian governments and industry needed to support disruptive technologies and new models. As a result, challenging existing structures and driving policy reform was a key priority. As our infographic shows, we have had some big successes in this area. Of course, we still have much to do in the advocacy and policy space – including achieving open financial data reforms and removing unnecessary barriers to new banking licences. But there is evidence of strong government progress in these areas. 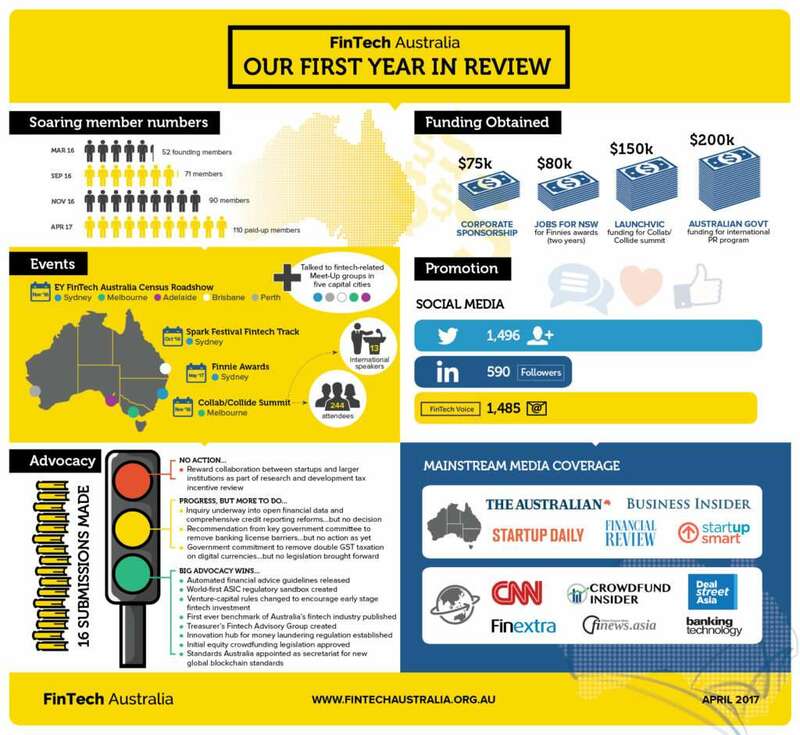 Our advocacy work was underpinned by a strong evidence base, including through working with EY to resource and release a fintech industry census in November 2016. This census represented a deep dive, backed by 200 responses, to better understand and describe the Australian fintech industry and its key issues. It remains a well-utilised and much respected document worldwide. Until we conducted this research, we really didn’t know where Australia’s fintech companies were located, or their industry sub-sectors, let alone whether they were finding it easy or tough. The information gleaned from this census has helped ensure our advocacy and promotion work is based on fact, not rumours or half-truths. Another early aim of the association was to connect the ecosystem, to accelerate our individual success and collective impact. There has been much happening in this space, including through our Collab/Collide Summit in Melbourne last year which attracted 244 attendees and 13 international speakers. We also drove the 2016 Spark Festival fintech track in Sydney and in January this year launched the Finnies, the inaugural industry-backed fintech awards. We’ve spoken at meetups around Australia, and flown the Australian fintech flag at major conferences throughout the region. These events have been a key reason why our membership has more than doubled in a year. We’ve also enjoyed great financial and other support from a wide range of partners, including corporates, governments and the media. For instance, we’re currently implementing an international public relations program to let the world know about our exciting fintech environment, thanks to a $200,000 Australian Government grant. We’re hoping this program will help influence major global investment decisions in favour of Australian fintech. Importantly, this wider support has never compromised the ability of FinTech Australia to speak up on behalf of our industry, even if this is in opposition to government positions. As a quick scroll of our news releases shows, when we feel the need for change we will state it. So have we made a difference? Well, some of the early international ranking results published this year seem to show that it’s quite possible we have. For instance, Sydney and Melbourne both increased their rank in the Global Financial Centres Index published in March, while Sydney jumped a rank in the Deloitte’s latest international review of global fintech hubs published in April. Perhaps the most exciting result was the KPMG 2016 Pulse of FinTech report which showed that Australia’s fintech investment more than tripled from $185 million in 2015 to $656 million in 2016, defying a 47 per cent global dip in the same period. With some incredible announcements in the pipeline, and an ever-growing parade of international investors visiting our shores, I have no doubt this trend will continue. This result is great news for our industry, which is expected to be one of the key drivers of new jobs and investment in Australia for years to come. There is much to tackle in the year ahead, on which we will have more to say shortly. But in the meantime, it is worthwhile to reflect on what has been achieved, thanks to the fintech community coming together just over a year ago, and our many supporters, partners and friends.